Pupils from a Croy primary school teamed up with St Mirren star Myles Hippolyte at Hampden last week to launch a new edition of a popular national seven-a-side competition. The P7 kids from Holy Cross Primary and Myles were marking the start of the annual Scottish Schools Football Association (SSFA) Soccer Sevens Competition. 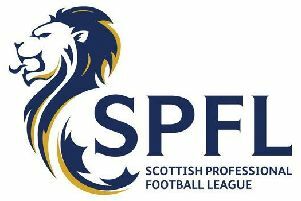 And while the 2018/19 competition is only about to kick off, it’s already scored a hat-trick of firsts with a new sponsor, a new name, and a new goal of supporting the STV Children’s Appeal. Former Livingston and Falkirk forward Myles said: “SSFA does so much to develop football in Scotland and its annual schools’ tournament plays a really important part in that by introducing so many boys and girls to the game. “Providing opportunities to get involved in the sport is all about improving young lives. “So it’s great that the impact of this year’s tournament will reach even further and the Concept Soccer Sevens 2018/19 will be helping kids coping with difficult circumstances.